Whether you’re following carb restricted diets like Atkins or Paleo, or if you’ve decided to cut carbs to lose weight, it can be a struggle to find delicious low carb recipes you and your family will love. But fear not; I’ve got some fantastic recipes for you to try out today. Here are 7 low carb recipes that taste amazing. 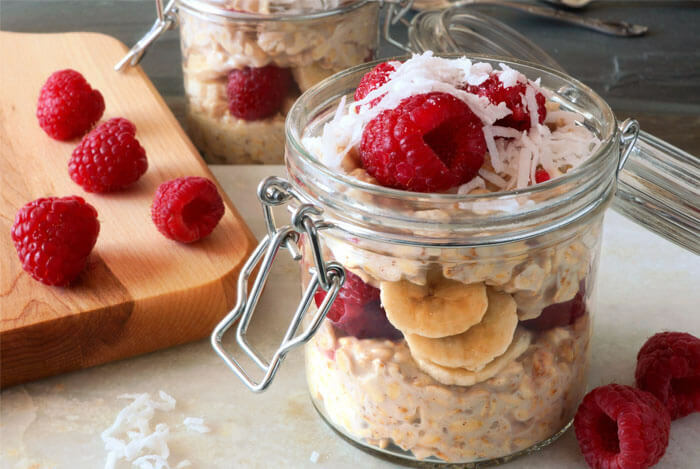 I’m a big fan of recipes like overnight oats, egg and veggie bites, and yogurt parfaits. 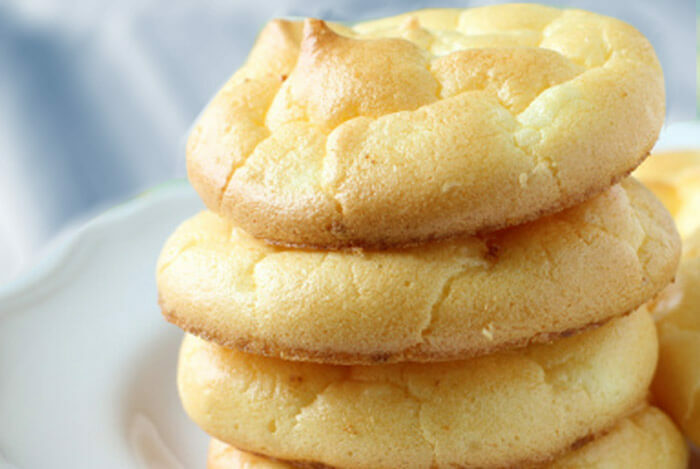 But did you ever think pancakes would make my low carb recipe list? 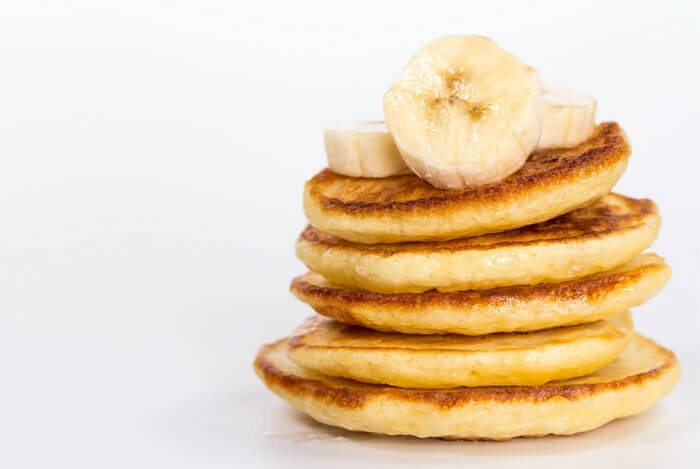 Even I was surprised when I came across this recipe from Muscle and Fitness for No Carb Banana Protein Pancakes, so I had to share it with you guys. Mix all of the ingredients together to form a thick batter. Spray a flat pan or griddle with nonstick cooking spray (or else they’ll stick). Spoon out pancakes according to how big or small you like them and let them cook 1-3 minutes on one side and 1-2 minutes on the other side after you flip them. Serve warm with chopped bananas, cinnamon, or honey. This will be a sweet way to start your day and you’ll also have enough protein to make it to lunch without snack cravings. 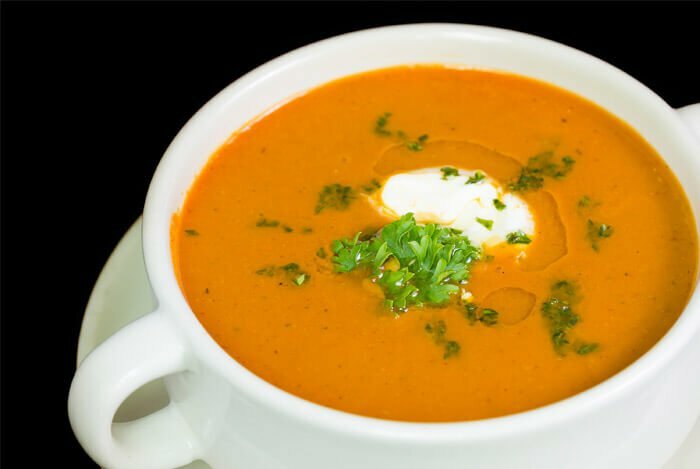 I don’t know about you, but I love having a cup of soup along with a big sandwich for lunch. I discovered Cloud Bread, thanks to A Seat At My Table. With almost no carbs and lots of protein, this bread is the lightest way to enjoy having that lunch staple sandwich without all the white flour found in regular bread. Plus, this recipe is gluten and grain free. That’s right, there’s zero flour in this ‘bread’ dough. Preheat oven to 300 degrees F. Spray a lined cookie sheet with cooking oil. Separate eggs; yolks in one bowl, egg whites in the other. Add the cream cheese to the bowl of yolks and mix well. Add the cream of tartar to the egg whites and beat on high with a mixer until peaks form. Slowly combine the yolk mixture with the egg whites and fold carefully. The mixture should remain fluffy like a cloud so be sure not to over mix. Spoon the mixture onto the prepared baking sheet, making rounds about the size of sandwich bread rolls. Cool on a wire rack. When they’re done cooling, store these babies in a plastic bag or Tupperware overnight in the fridge. When you wake up, you’ll notice that your little pillows will have magically turned into buns. I love using these for turkey sandwiches and even burgers. But my favorite way to use them is for avocado egg salad sandwiches. 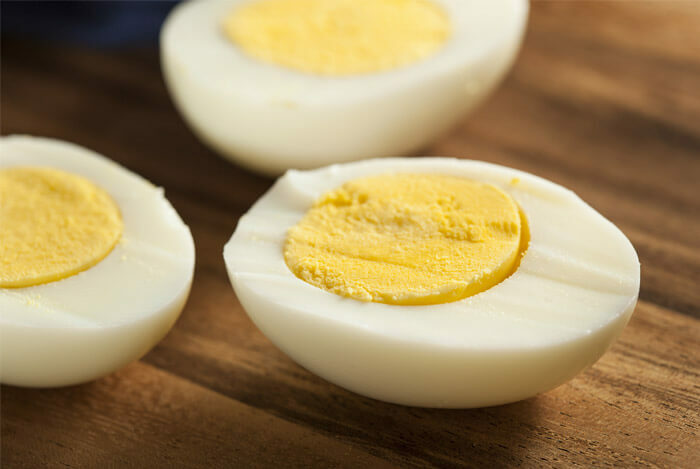 With only one gram of carbs per two eggs, it’s not hard to see why eggs are a great addition to any healthy, low carb diet. Plus, by switching out mayo for the creamy deliciousness of avocado, you increase your intake of good fat. Did you know that avocados contain 71% monounsaturated fat, one of the healthiest types of fat we can eat? Hard boil your eggs, cool, and chop. Mash the avocados and add them to the chopped eggs. Add the lemon juice, salt, pepper, and paprika to taste. You can eat this straight out of the bowl you’re mixing it in (which I can’t help but doing), but if you’re making a sandwich with the cloud bread, line the top and bottom bread slices with lettuce to keep the bread from getting mushy and soggy from the egg salad. Spoon some egg salad on the lettuce and assemble into a yummy sandwich. You’ll be satiated and energized to tackle the rest of your day with ease! It’s easy to pack a low carb lunch for work but it’s a whole different story trying to make low carb dinners your family will enjoy. It’s hard enough trying to please other palates, but now you have to attempt to get those palates to like ‘healthy’ food too. Take a typical take out night for example. 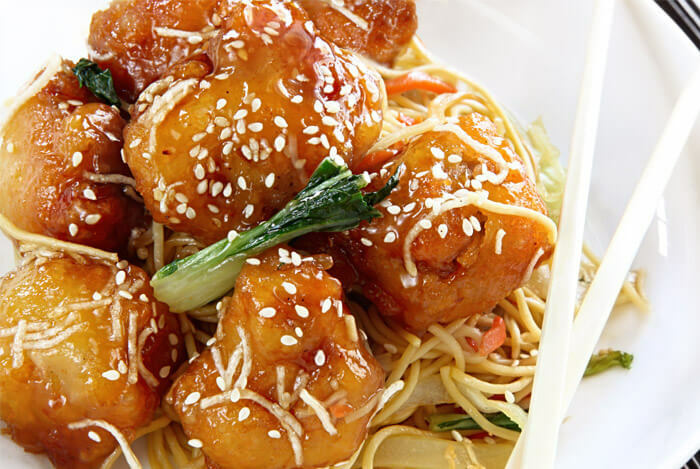 Instead of ordering battered chicken with sugary sauce, try making your own Asian inspired meal at home. 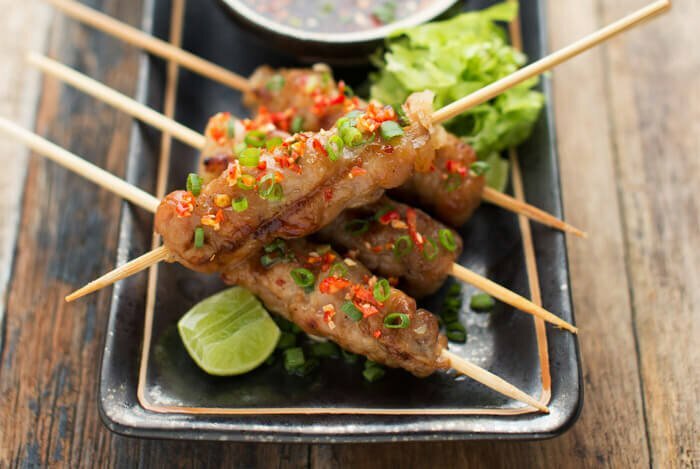 My Kitchen Escapades grilled up these mouthwatering skewers with pork as the low carb protein, but I’ve adapted them to make this recipe a tad healthier. You can find the original recipe here. You can use a jarred chili sauce, but be careful about the sugar content. To avoid that, I like to use this recipe from Jeanette’s Healthy Living instead. Trim off the stems of the chilies. If you like very spicy sauce, keep the chilies intact. If you prefer a mild sauce, cut the chilies lengthwise and remove the seeds. I prefer a mix so I remove about half of the chilies’ seeds and keep the other chilies intact. Place the chilies and the other ingredients in a food processor and process until the chilies are finely chopped. Store the processed mixture in a glass container and cover with plastic wrap. You can use this sauce immediately, or you can keep it on the counter top for about a week to intensify and develop flavors. You’ll want to refrigerate it after that. Combine the marinade in a large bowl. Add the cut pork to the marinade and cover. Let the pork and sauce marinate in the fridge for about 4-8 hours, or overnight. When you’re ready to cook, preheat a grill or grill pan on high heat for 8-10 minutes or until super hot. Skewer the pork chunks while you wait for the grill to warm up. Place the pork skewers on the grill for 5 minutes. Flip the skewers over and continue to grill for another 3-5 minutes, depending on how thick your pork pieces are. What goes better with Thai pork skewers than fried rice? Ok, I lied. This is not fried rice. It’s better. From cauliflower pizza crusts to mashed cauliflower instead of potatoes, this nutritious, versatile vegetable is on the rise in the world of low carb living. And after this recipe, you’ll see why. 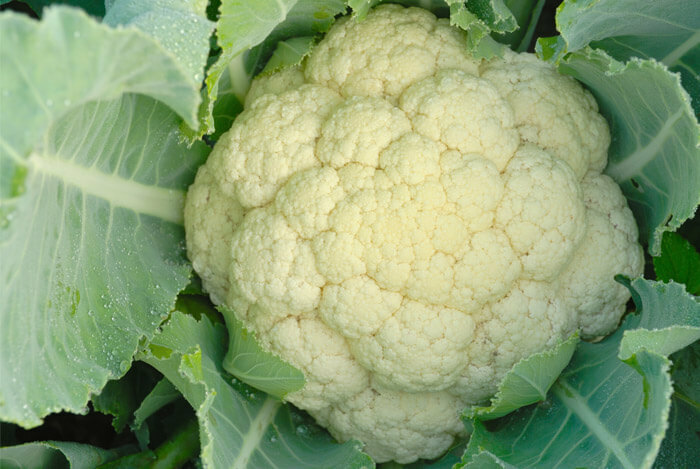 Chop the cauliflower into small florets and add them to a food processor. Pulse until the cauliflower starts to look like tiny grains of rice. Cook your eggs until scrambled and then transfer to a separate dish. Add carrots, onion, garlic, and peas to a large skillet or wok with sesame oil, salt, and pepper. Saute for about 5-6 minutes on medium heat, or until the carrots are soft and the onion is translucent. Add the eggs and cauliflower to the veggies on the stove. Add the soy sauce. Cook through until the cauliflower is warm and tender. Sprinkle with green onions to garnish. 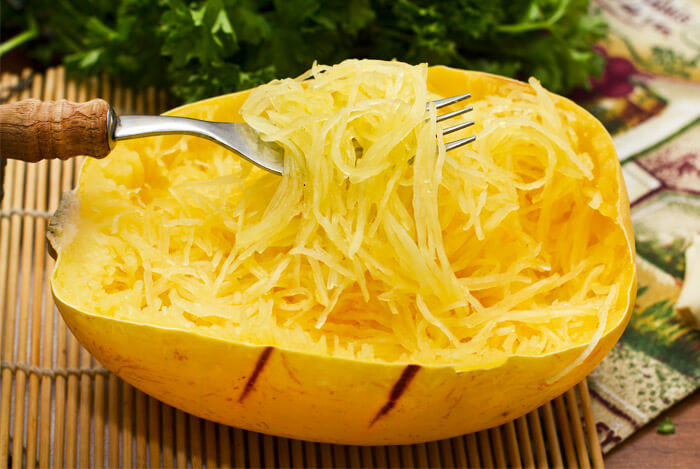 Spaghetti squash is unlike other squash in its family because once cooked, you can scrape out the innards and get long, spaghetti like strands (hence the name). This makes the perfect pasta swap. This recipe packs an amazingly low carb punch: spaghetti squash, mushrooms, and Gruyere cheese are all surprisingly low carb options to add to your diet. So this dish is a great way to incorporate all three into an earthy, soul-satisfying meal. Slice the spaghetti squash lengthwise in half. Scoop out the seeds. Place each half, flesh side down, on a microwaveable plate. Microwave for about 8-10 minutes, or until the squash is tender. The squash will be very hot so let it cool for around 5 minutes before you start scraping out the flesh with a fork. You’ll notice immediately that the strands look just like spaghetti. While the squash is cooking, add the olive oil and garlic to a large pan over high heat and cook for about 2 minutes. Add the mushrooms to the pan and cook for about 6-7 minutes, or until dark and tender. Lower the heat to medium and add the spaghetti squash to the pan of cooked mushrooms. Add the grated Gruyere and let it melt into the mixture. Turn the heat off, spoon out into bowls, and add parsley and shaved Gruyere to top each dish. 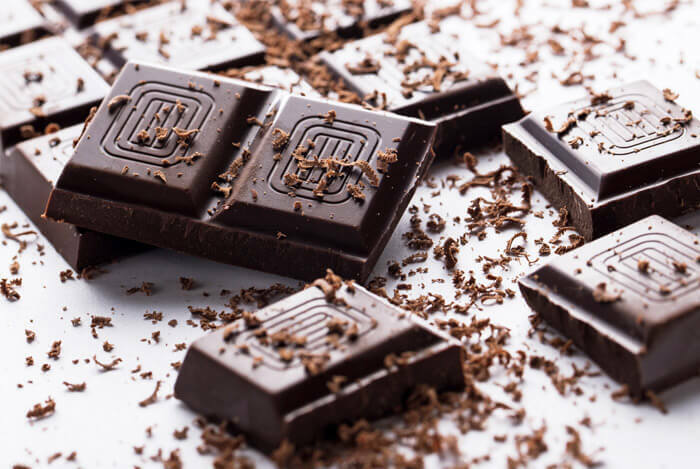 Eating a healthier diet doesn’t mean cutting out all sweets, but it does mean you have to be smart about your choices and enjoy them in moderation. That’s why I love this final recipe, it transforms a classic dessert item and makes it just a bit healthier. Trust me, this low carb option won’t disappoint. You can praise the Low Carb Diet for this gem. 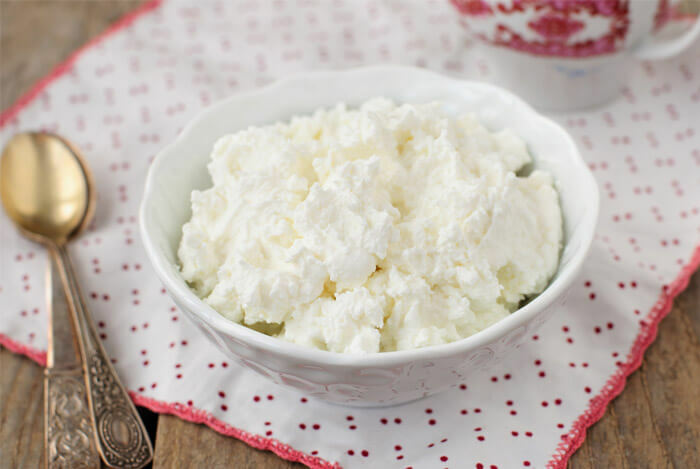 This is one of my favorite recipes because it gives you a perfectly portioned sweet crunch, plus the cheese offers up calcium and creaminess. Preheat oven to 350 degrees F. Spray a mini muffin tin with nonstick cooking spray. Mix all of the cannoli cup ingredients together until well combined. Press cup mixture into muffin slots to make a cup for the cannoli mixture to sit in. Bake for 15 minutes and let cool. While the cups are baking, use a mixer to combine all of the filling ingredients together until light and fluffy. Place the mixture in the fridge until the cups cool down completely. Once they’re cool, spoon the cannoli mixture into the cups. Top with chocolate chips. I hope I’ve shown you that eating low carb doesn’t mean having to eating steaks and salads every day. With a little tweaking and imagination, you can turn any of your favorite recipes into low carb treats. What’s your take on low-carb recipes? Have anything else you’d like to share? Let me know in the comments below!